Recent years have shown us that we can’t rely on the “superiority” of the American economy to increase our personal wealth. Many people lost their entire retirement savings when their 401(k) accounts tanked to nothing after the housing crisis. Other people lost their homes – their only “nest egg” for their future. We’ve only recently seen the housing market bounce back here in Phoenix, Arizona, but our overall economic future remains uncertain, especially with the turbulence of the election and world politics. You can’t save and hope for the best, and you can’t invest with certainty. The only thing you can do to protect your financial future is to buy gold, one commodity that does not ever lose its value. Your cash can become completely worthless in a financial crisis, but your gold will retain its buying power. The value of gold rises steadily with the times, and it is not as influenced by inflation. You might think of stacks and stacks of gleaming yellow bars when you think about buying gold for wealth. While you can buy bars of gold, that’s not your only option (nor may it be a feasible option for you unless you have a lot to spend). There are actually thousands of forms of gold you can buy, which is known as bullion. The most common types of gold bullion that investors buy are bars and coins. Bars are usually 400 troy ounces, which is about 12.4 kg. Since bars are very expensive (about a half million dollars, depending on the current price of gold), most people choose to buy coins or other types of bullion. The most popular gold coins that people buy are Canadian Gold Maples, U.S. Gold Eagles, Austrian Philharmonics or Kangaroos, and South African Krugerrands. These are issued by the mint of each country, and many of them weigh one ounce. The price of gold changes minute to minute. It is heavily traded on the markets, so you could buy gold for a different price in the morning than you could buy it after lunch. Ditto for if you want to sell gold. If you are buying in person, you’ll see a posted price, which will likely change throughout the day. If you are buying online or over the phone, you’ll have to lock in a price as you are placing your order or making your payment. Spot prices are very important to making the right investment or sale. If you time it just right, you can buy gold at fantastic prices and maximize your profits. Timing will also ensure you sell gold at just the right price to get the most you can from it. Doing your research will help you best identify the right timing for buying and selling gold, and you can work with a broker to help you get the right timing, as well. There are many places where you can buy gold bullion, but many first-time buyers are nervous about buying from the right sources lest they get low-quality gold or are gouged on prices. You can research the source of your gold to avoid these kinds of problems. You can buy gold coins from the government mint, or you can get them from reputable pawn shops in Phoenix and coin shops in Phoenix. A pawn show is a good place to shop since it will have numerous vendors in one location, and you can play them off each other to get the best prices. You can also buy online from numerous brokers and refineries. Just make sure you are buying from a licensed commodities broker, which you can check through the National Futures Association. Buying gold can be a great investment if you buy the right gold from the right dealer at the right time. Figure out a secure way to store your gold, such as in a bank or a personal safe. The quantity of gold you have will determine how much security you need and whether it is cost-effective to pay to store it. 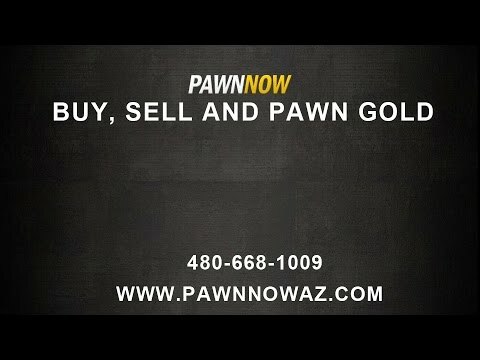 If you are looking to buy gold coins or gold jewelry, visit Pawn Now in Phoenix, Arizona. We have nine Valley locations for your convenience, and we buy and sell gold of many types. You can visit us to add to your collection, or you can sell some of your gold to raise cash for other needs. We also attend pawn shows in the area, so you can find us at these events. Contact us today to learn more about our inventory or our current buy and sell prices.